Bangkok was founded in 1782 by King Rama I. 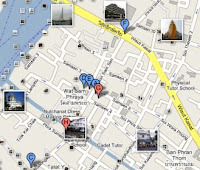 A century ago, Bangkok had many river and canals known as "Venice of the East". The past 30 years, more roads were built with the sacrifice of these canals. The population of Bangkok is estimated to be closer to 15 million people. Thai greeting call as the wai (Thai: ไหว้). The higher the hands are held in relation to the face and the lower the bow, the more respect or reverence the giver of the wai is showing. The wai is also common as a way to thank someone or apologise. The word often spoken with the wai as a greeting or farewell is sawatdee (สวัสดี). This word was coined in the mid-1930s by Phraya Upakit Silapasan of Chulalongkorn University. The strongly nationalist government of Plaek Pibulsonggram in the early 1940s promoted the use of the word sawatdee amongst the government bureaucracy as well as the wider populace as part of a wider set of cultural edicts to modernise Thailand. "We established since 1962 "